Greenlight, a Seattle-area startup, has announced its first product: a dashboard-mounted cradle for mobile phones. The cradle charges phones and also comes with an app that records data; it uses the smartphone’s front-facing camera as a dashcam, automatically saves video and uploads it to the cloud when it detects a crash. Engineers plan to add a driving summary feature that will give drivers more information about their trip distance, speed, acceleration and braking habits, and more. The company’s eventual goal is to create a numerical “driver score” that will quantify how safely a user is driving and give driving safety tips to users who drive erratically. The company collects data on drivers’ habits so they can compare an individual’s habits to average and ideal behavior on the road. Why is a company turning cell phones into driving-assistance devices? Jason Green, CEO of Greenlight, hopes his product will prevent drivers from using their phones for more distracting activities while they’re behind the wheel. Apart from a button that drivers can push to save video, there’s no need to interact with the app while driving. Music and GPS can run automatically in the background without additional input from the user. The automatic crash detection feature, combined with video recording, may prove valuable to users who witness accidents or get into accidents themselves. In the long term, Greenlight hopes that insurance companies might be willing to lower monthly rates to drivers who prove that their driving habits are above average. Why does Greenlight want to rank drivers on habits like steady acceleration and braking? According to traffic safety experts, driving smoothly can actually prevent large-scale problems like traffic jams. Electrical engineer William Beaty ran experiments in Seattle’s famously erratic traffic: instead of accelerating to the maximum possible speed in traffic, he traveled at the average speed of the cars around him and tried to avoid braking whenever possible. Beaty pictured traffic flowing like a liquid, with traffic jams moving in “waves” as each car’s behavior was determined by the behavior of the cars in front of it. If the leading cars accelerate and decelerate quickly, they force every driver behind them to start and stop in the same pattern. Even though he was traveling more slowly during his experiments, his behavior actually sped up traffic overall by encouraging the drivers behind him to move at a slow but constant speed instead of getting stuck in jams. Beaty performed his traffic experiments on highways, where cars could theoretically travel at a constant rate of speed. 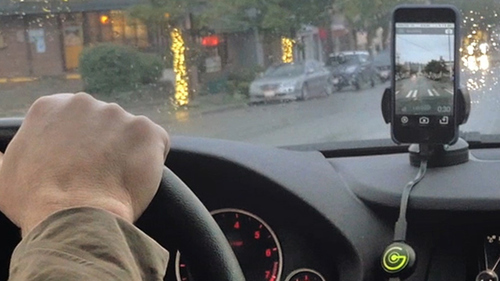 In Seattle’s stop-and-go surface street traffic, Greenlight may face unexpected challenges as it tries to quantify safe driving. Seattle’s congestion is only getting worse as the population booms, bus lines get cut, and infrastructure projects stall out. The city also receives consistently lousy rankings when it comes to accident frequency, with the average driver experiencing a vehicle collision once every seven years. Is a high-tech gadget enough to reverse that trend? Will drivers even be willing to use a gadget that collects and shares so much information about their driving habits? Greenlight and its partners have a lot riding on drivers’ willingness to seek out more data on their behavior behind the wheel. If you have been in a distracted driving accident, contact the award-winning legal team at Davis Law Group in Seattle.